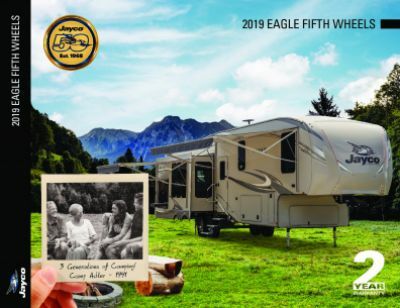 See the country with the 2020 Jayco Eagle HT 25.5REOK 5th Wheel! At All Seasons RV, our dream is to see that every one of our customers gets to own the RV of their dreams! We've been doing just that for years, which is why we're one of the top RV dealerships in Michigan! We have a massive inventory of all the top RV brands and models, and you can stop into our huge indoor showroom and tour all of our great RVs in comfort and leisure! Our knowledgeable, professional, and courteous staff will show you how easy it is to own your dream RV! So come in today! We're conveniently located at 4701 Airline Rd Muskegon Michigan 49444 and we're always ready to help our customers find the RV they've always wanted! Even if you don't live in Muskegon, we can still make your dream come true, thanks to our fast, reliable, door-to-door delivery and quick, easy financing! Give us a call at 231-739-5269. Your dream RV is waiting! The 2020 Jayco Eagle HT 25.5REOK is sleek and handsome at 29' 1" long, 8' 0" wide, and 12' 8" high! It has 2 flush mount slides for easier towing and a sturdy GVWR of 9995 lbs. for years of camping fun! The 20' 0" patio awning opens easily for shade and UV protection! 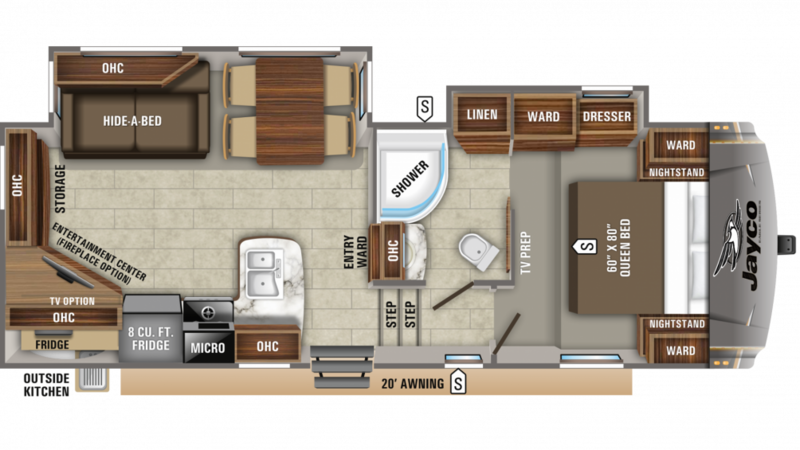 Your days of RV fun will be topped off by a great night's sleep in this 5th Wheel because there's sleeping space for up to 4 people, and the Queen bed in the master bedroom is roomy and comfortable! Everyone will have sweet dreams! Instead of eating out every day, save money and enjoy fresh food inside with the kitchen's 3 burner range cooktop and 8.00 cu. ft. refrigerator. The 42 gallon freshwater tank provides clean drinking water in the sink. You'll have exclusive access to a Porcelain Foot Flush toilet and a shower anywhere and anytime, thanks to this model's full bathroom! There are 60 lbs. of LP tank capacity providing heat, so your showers stay hotter for longer! The 65 gallon gray water tank and the 32 gallon black water tank help you avoid dealing with waste and used water while you're having fun on the campground! Add delicious snacks and drinks to your tailgate, picnic, or campfire! The outdoor kitchen allows you to make hot, tasty treats outside!